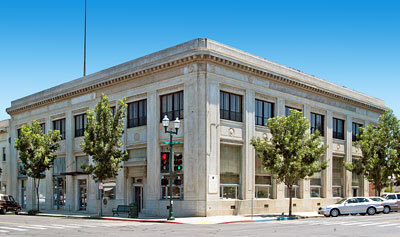 The design of the Bank of Los Banos building is neo-classical, a style ubiquitous throughout the United States in the early 20th century for institutional and public buildings. The exterior effect is blocky and massive, an intentional choice for the building's function as a bank and one of the main commerce buildings in Los Banos. Architect H. H. Winner described his design as Italian and pre-Renaissance. The building's size and design were a testimonial to the substantial commercial empire built by its owners Henry Miller and Charles Lux, both immigrants from Germany. The Miller-Lux empire grew to include cattle holdings, land holdings, and the San Joaquin and Kings River Canal and Irrigation Company. Miller and Lux were instrumental in obtaining the Southern Pacific Railroad line one block from the site of the Bank of Los Banos. The town's development, which blossomed with the coming of the railroad, centered around the Southern Pacific Railroad Depot.